Posted by Rutger on 2010/03/02 . Leave a comment. Due to the migratory nature of Svensk Standard members, this winter has seen the upstart of a small Svensk Standard branch located in Melbourne, Australia, accompanied by an entry in the Laneway Competition 2010, a public art competition in Melbourne. While researched and conceptualized by the Melbourne team, the production would be split between Sweden and Australia, creating an intentional glitch, a lost-in-translation-factor where one team was perfectly in tune with the sites, with their physical and cultural context, and the other would be completely clueless. Tristan and I have been wandering the lanes for weeks now. At first we were attracted to the dirtiest and the ugliest of them: the lanes that felt like vertical sewers. Tiring of wading through the rubbish, however, we soon turned our attention to the sleaziest lanes which thread through the business district, behind the strip clubs and seedy bars and corporate headquarters and law courts. Eventually, we became dissatisfied with our own journeys and elected to follow others, who – more often than not – never went into the lanes, and when they did, disappeared into the rear doors of what we can only imagine might be workplaces, but which might have been something entirely different. The mystery, it seems, was always on the other sides of those doors and walls: in the private spaces behind and alongside the lanes. In the buildings. The lanes themselves seemed to hold little mystery of their own: everything seemed so familiar, just a repetition of elements. A basic geometry. 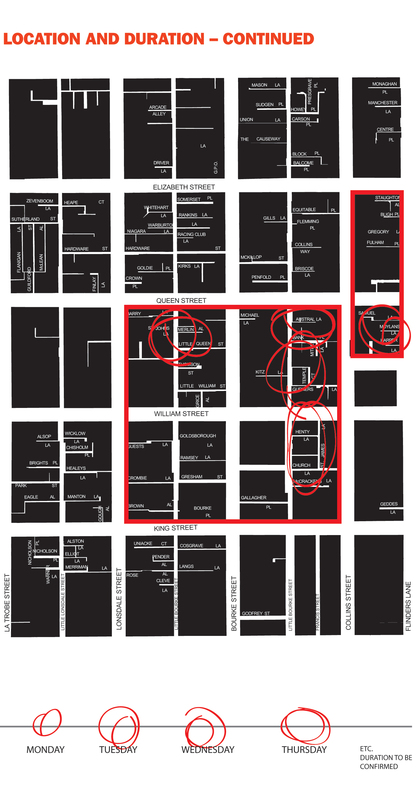 The familiar, the recognisable, that which makes the laneways what they are, and in turn Melbourne what it is, had reached a point of saturation. Perhaps we can only value that which is unknown, foreign, strange. We feel this must be the case. In order to advance our project further, we therefore send you the unappreciated, banal and everyday artefacts which we collected in our journeys, objects (and, indeed signs) which make up the graphic and material language of the lanes – a language which we (like perhaps millions of other Melbournians) are presently unable to read, in our current state of distracted overexposure. We hope that you might take them and through your own work make them foreign to us again. We would like you to estrange us from them, just as you are estranged from us. Take one or many, and do what you can. If you need any further information (dimensions, materials, or anything else that may be useful in this task), please do not hesitate to contact us. Thrilled by the sudden removal of contextual restraint, the Stockholm team grabbed their pens and laptops and set out create something thoroughly unnatural. The object move mechanically and correspond to the different sounds in the “Laneway Back Alley Funk” which is played through a hidden speaker system. The objects get a new relation to each other, and become parts of a new system that replaces their former programmes. The totems whisper to each other continuously, amuses itself by telling funny stories etc, but whenever someone approaches the alley they hush each other to silence. 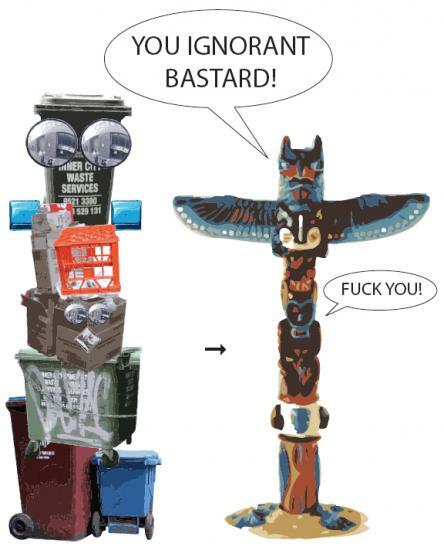 However, the totem can be aggravated and stressed out by the presence of a crowd, yelling out curses to anyone present. The pole is constructed from the given objects in the catalogue. 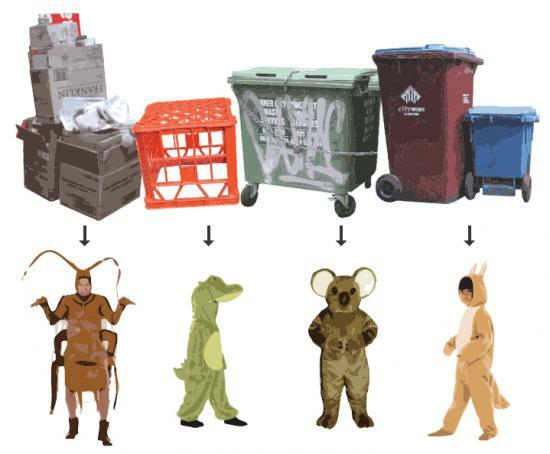 Disguising the objects as creatures with costumes, creating a sence of unnaturalness by adding the image of nature. For added estrangement it is also possible to apply this concept to the preceding programmes. Back in Melbourne the sweded objects were recontextualized and injected back into their original environment as agents of estrangement. At the 22nd of January the final proposal was handed over to the City of Melbourne. Weary of both the dominant modes of working as “foreign architects”and of the dominant elements of architectural discourse addressing “place-making”, we would dearly like to consciously side-step both the ignorant imposition of foreign forms on unfamiliar contexts, andstrategies of “gentrification through glorification” whereby elements of historic urban fabric are scrubbed clean of their present (undesirable) uses in order to introduce foreign programs. Whilst the former mightbe termed the “Bilbao effect” and has been idolised by those interestedin placemarketing via architecture (or simply besotted with Frank O. 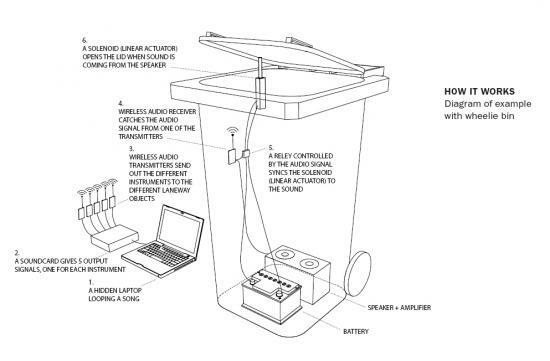 ), the latter presents a more covert way of sanitizing the messy, gritty, difficult areas in cities by creating “buzz”. Through all of work, and this submission, we wish to propose an alternative to this way of working as architects, and a conscious critique of the above. 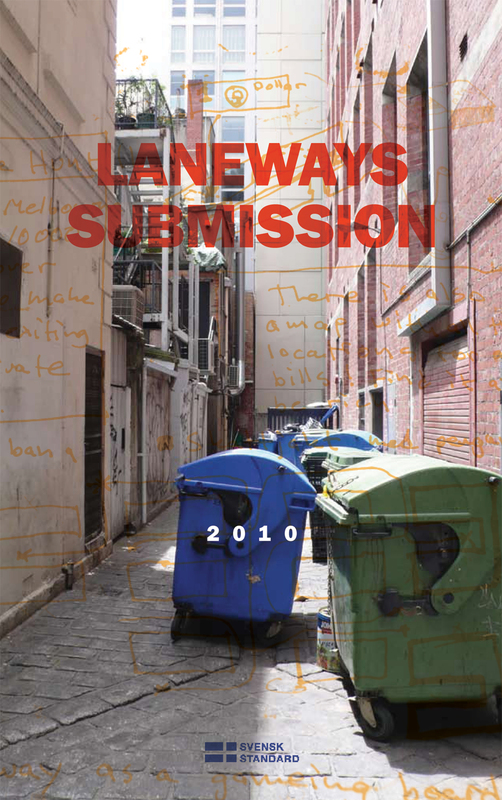 Perhaps there is a hint of irony in reacting against processes of architectural santization when talking about Melbourne’s laneways, long a city-sized sanitation device in themselves. Despite radical changes to the form and fabric of the city, and as such to the buildings abutting their edges, the laneways have retained their utility as a “backstage” to Melbourne’s streets. A place (once you move away from the lattescented alleys of the south-eastern corner of the city) where garbage bins rest in neat rows, leant upon by piles of cardboard boxes and pyramids formed by used drums of cooking oil. Even the rings of empty bottles circling upturned milkcrates like sharks seem familiar, even somehow necessary within this environment – certainly not a surprise, in any case. It is in this safe, familiar, utilitarian order of “things” that the site of our proposed project lies. Project by: Helen Runting, Tristan Main, Ola Keijer, Rutger Sjögrim, Sara Liberg, Markus Wagner.